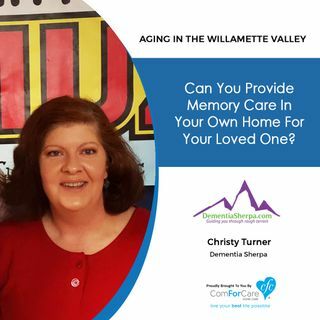 6/5/18: Christy Turner with DementiaSherpa.com | Can you provide Memory Care in Your Own Home for Your Loved One? In this episode, Christy Turner, the Dementia Sherpa, is our guest, and we are talking about memory care at home. You've heard of memory care facilities, but Christy talks about keeping your loved one home instead of moving them to a memory care facility. It's not easy, but Christy gives guidance on how to do this for your loved one with dementia. You don't want to miss this episode and the riveting discussion!